"Now the Turkish regime seems to be deaf to any proposals made by us for civilized and democratic solutions to the conflict between us.Indeed,the Turkish government is more resolved than ever to solve the Kurdish question by bloodshed." A helicopter in the operation was downed. Five Turkish troops, among whom was a brigade commander, were killed and 19 wounded due to a military helicopter downing in an operation in Hakkari's Kavaklı region. According to the information received, a clash occured between TSK and HPG, after TSK began an operation in Hakkari's Kavaklı region. One of the helicopters, which came from Hakkari Dağ and the Commando Brigade Command to intervene in the clash, was downed by the guerrillas. In the incident, five soldiers, among whom was a brigade commander, were killed and 19 wounded. The Turkish general staff confirmed the incident and claimed that the helicopter was "cut down" due to "technical problems". The general staff had used the term "cut down" [kırıma uğradı] in the aerial attack against South Kurdistan's Zap region, where the TSK was defeated [in February 2008]. Meanwhile, several soldiers were mobilized to the area of the clash until late in the night. In addition to using the phrase "kırıma uğradı", TSK now also uses the phrase "etkisiz hale getirmek", meaning to neutralize or de-activate, when making statements about alleged HPG casualties. The implication of the use of this phrase on the Turkish public is that HPG guerrillas have been killed by TSK. However, if guerrillas are killed, TSK will say "killled". Again, this is like the statements TSK made in February, in which they led the Turkish public to believe that "hundreds" of guerrillas had been killed, when using the phrase meaning "neutralized". In other words, both "kırıma uğradı" and "etkisiz hale getirmek" are Turkish Newspeak, with no practical meaning vis-a-vis the Kurdish freedom movement. "The government fell into a new trap of Barzani, who wants the Turkish government to endorse his presence in northern Iraq," said Devlet Bahçeli, leader of the Nationalist Movement Party (MHP), at a parliamentary group meeting of his party yesterday. "The plot is obvious now: The mastermind of terrorism is Barzani; its executive center is in the Kandil Mountains and the Justice and Development Party [AK Party] is courting it," the MHP leader said, accusing the ruling party of "being on the same page as the PKK and Barzani." Look at the scenery. We are expecting "goodwill" from Talabanî and Barzanî. We have talks. We give them ultimatums. Now there is preparation for diplomatic action. There will be talks with Talabanî and Barzanî. A common strategy would be enhanced for a mutual struggle against the PKK. Does not contact or speak to the elected parliamentarians [DTP] in its own parliament . . . Goodwill is bankrupt. 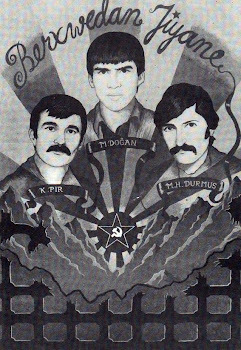 They are not being spoken to, rather they are talking to Barzanî (Kak Mesut, not Mam Mesut), who is considered as one of "our three leaders". Every time Barzanî points to "them" [DTP]. Barzanî says, "You do something at home, I will help out". Barzanî refers to the "unspoken-to parliamentarians" by saying "at home". "It can't be! At home we are shutting down DTP. Externally, we talk to Barzanî's Iraqi KDP. What kind of contradiction is this? What kind of paradox is this? Reality is sometimes revealed piece-by-piece, and each detail, like a Lego, completes and creates the "big picture". I define such a "big picture" as "public reality." This week, I am also adding some pieces to this "public reality". Was there any offer taken to "terrorist" leader asking, "Let's solve this problem with you"? Does such bargaining exist? "As MİT, our duty is even to talk to snakes, if needed. We can contact anyone. Even with the enemy." Barzanî told MİT chief Emre Taner, "You take a step. We will disarm them." "Now there isn't any operation, if we don't do anything the operation will restart." (Indeed, today it already started). MİT chief Emre Taner had contacted Talabanî and Barzanî. Regarding PKK, the organization had a three-dimensional facet, Imralı [Öcalan]-Murat Karayılan (mountains)-Zübeyir Aydar (Europe). These contacts also occured. The goal was to make the "terrorists" lay down their arms, diffusing the administrative group in the mountains. For this reason, there were contacts with both the "terrorist" leader and the ones in the mountains. As a result, according to this plan, the weapons could be layed down in a "no-loser" solution. At least, the expectation was so. However, the government did not take the initiative, did not give any negative or positive response. And especially the military (so then, the chief of the General Staff, Yaşar Büyükanıt, and the Land Forces Commander, General İlker Başbuğ) refused the plan, were not convinced. They kept a distance from this plan. Therefore, the plan to descend from the mountains was left in the middle. "You, too, take some step . . . for instance, reduce the threshold for the elections to five percent, mention about cultural diversity in your constitution." This also backfired. Thus, the job was left to weapons again. The study that was done definitely was not "bargain with Öcalan", I mean with "the terrorist". It was a strategic preparation to stop the bloodshed. For this reason, the "we can contact even with a snake" phrase is important, since it was done, and maybe it is still being done. Therefore, the question that Ertuğrul Özkök asked must not be received and transformed into a case of "following the hounds". Ironic, isn't it, that MİT seems willing to negotiate a solution--and that goes farther back at least to Şengal Atasagun's time--while the Fethullahcı and their boys, the paşas, leave all attempts at negotiation untouched on the table? I'd like to hear what Taner has to say about PKK's offer of a democratic resolution. By the way, check out an article at the Christian Science Monitor about the recent woes of the TSK. It's the most complete summary in Western media that I've seen on the war news. I don't think should anyone look at the fascist Turkish media's article and think this journalist (Fatih Cekirge) may be into democratic solution of the Kurdish Question in Turkey. Even, if you are the most stupid person in the world or even if you are a most nationalist and fascist Turk still it is just common sense. Why the Turkish military and his Islamic administration seeking help from the Barzanis whom several times pointed the solution in democratical dialogue with the PKK? If this were what they talked about then why the hell these official would not talk to the Kurdish representations already in the parliament instead of trying to close their party. Fascist, bloodthirsty Turkish army generals have no intentions to solve the issue of Kurdish Question by means of peace or otherwise. These bastards are enjoying their small kingdoms in Kurdistan where they act like an evil blood sucking vampires. If the DTP actually manages to make it into the next election, they should not run as independents. Recent polls suggest their support level is near 4%, which is close to the threshold. I guess you mean up for 4% because the treshold in fascist Turkey is 10% and the DTP received almost 6 or 7% at the last election. DTP's having few more MPs in the Turkish parliement mean nothing in such a militarist fascist regime. Islamist Turkish PM openly addmited the fact that they have done everything the military asked from them so if the Turkish PMs only purpose to serve the Turkish army generals then one should ask "Why the public elections held every 4 year in Turkey?" Why the Turkish military generals appoint a PM to save all these expensive and nonesense election process? Fascist, militarist Turkey holds the elections to fool the world so that they can be member of the NATO or the EU. "If this were what they talked about then why the hell these official would not talk to the Kurdish representations already in the parliament instead of trying to close their party." That's what I've said for some time, Hamo. And that's what Cekirge is saying.